HARRISON, N.Y. -- One of the largest military and police officer's funerals in recent memory is set for Wednesday at St. Patrick's Cathedral for Tech. Sgt Joseph G. Lemm, 45, of West Harrison. Lemm, a New York Police Department detective the past 16 years was killed a week ago by a suicide bomber in Afghanistan. Another member of Lemm's security squadron from Stewart Air National Guard Base in Orange County and four Air Force officers also died in the Dec. 21 attack. Wednesday's 10 a.m. Mass of Christian Burial will be led by Cardinal Timothy Dolan, Archbishop of New York, and the Rev. Christopher Monturo, pastor of St. Anthony of Padua Church in West Harrison. Lemm will receive full police and military honors during Wednesday's funeral service, including a military helicopter flyover. More details about Lemm's surviving family and his funeral arrangements can be found in his obituary here. 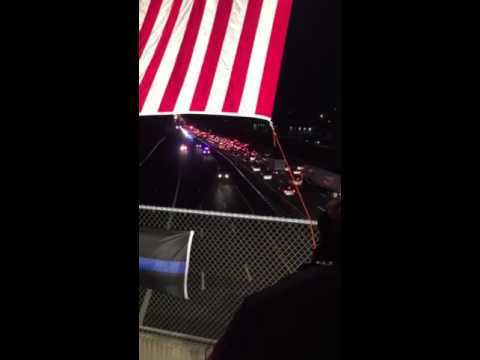 Police departments and Air National Guard units are expected to lead Lemm's funeral procession en route from Manhattan to Gate of Heaven Cemetery in Hawthorne, where he will be buried. Lemm's body was flown Monday from Dover Air Force Base in Delaware to Stewart Air National Guard Base in Orange County, where he served with the 105th Base Defense Squadron. Lemm is survived by his wife, Christine, a 17-year-old daughter, Brooke Lemm, and four-year-old son, Ryan. Calling hours are set for 2 to 5 p.m. and 7 to 9 p.m. on Tuesday at St. Anthony's Roman Catholic Church at 85 Harrison St. in West Harrison. Parking restrictions will be in effect from noon to 10 p.m. Click here for a Go Fund Me account created for Lemm's family. Lemm enlisted in the 105th Airlift Wing in 2008, serving his entire time with the 105th Base Defense Squadron. He had previously served in the military from 1988 to 1996. Lemm's prior deployment experience included missions to Afghanistan from January to June 2013 and to Iraq from June to December 2011.